The year 2011 saw some amazing astronomical discoveries and unforgettable spaceflight events, so it comes as no surprise that many of those cosmic happenings were caught on camera. For SPACE.com readers, some of those events were more gripping than others, especially when it came to space videos. 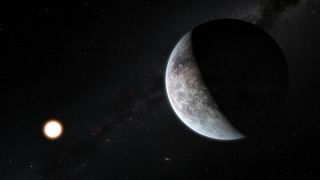 Take a look at the five most popular space videos of 2011 and if you don't see you're favorite, don't worry. You can relive the space events in our SPACE.com video archive, or look forward to a promising out-of-this-world year in 2012. In October, the private spaceflight company Virgin Galactic dedicated a hangar at Spaceport America in New Mexico, a rocket launch site slated to be the space tourism company's homeport for passenger spaceflights. The hangar dedication followed a 2010 runway dedication that saw Virgin Galactic's flagship spacecraft, the SpaceShipTwo Enterprise, make a landing at Spaceport America seen here, a video that drew major interest among SPACE.com readers. No. 4) NASA Telescope Discovers 16 "Super-Earths"
On Sept. 12, scientists announced the confirmation of 50 newfound alien planets, including 16 super-Earths that were slightly larger than our home planet. The planets were discovered using a telescope in Chile operated by the European Southern Observatory. To mark the discovery, ESO officials released this video to review the 16 super-Earths found. In August, the U.S. military launched a test flight of a hypersonic bomber prototype, known as the Hypersonic Test Vehicle 2, on a flight that reached the ultra-fast speed of Mach 20 before plunging into the Pacific Ocean. The unmanned hypersonic drone flight was overseen by the Defense Advanced Research Projects Agency, which detailed how the mission would work in this video. Sept. 11, 2011 was a somber day for Americans, with memorial services across the country for those killed in the terrorist attacks of Sept. 11, 2001. Ten years earlier, on the day of the attacks, NASA astronaut Frank Culbertson was living aboard the International Space Station - the only American off the planet at the time - and was shocked to see the destruction of the World Trade Center in New York City from orbit. He took this video and sent comments to NASA's Mission Control center in Houston at the time. The undisputed winner is this video of NASA's defunctUpper Atmosphere Research Satellite taken just days before the huge spacecraft fell to Earth in late-September. Veteran astrophotographer ThierryLegault used a 14-inch telescope equipped with a camera to record the video from Northern France.